For those who like American Indian culture, this game will be of interest to you. But IGT have designed it so that no matter your interests, the game will be a hit. 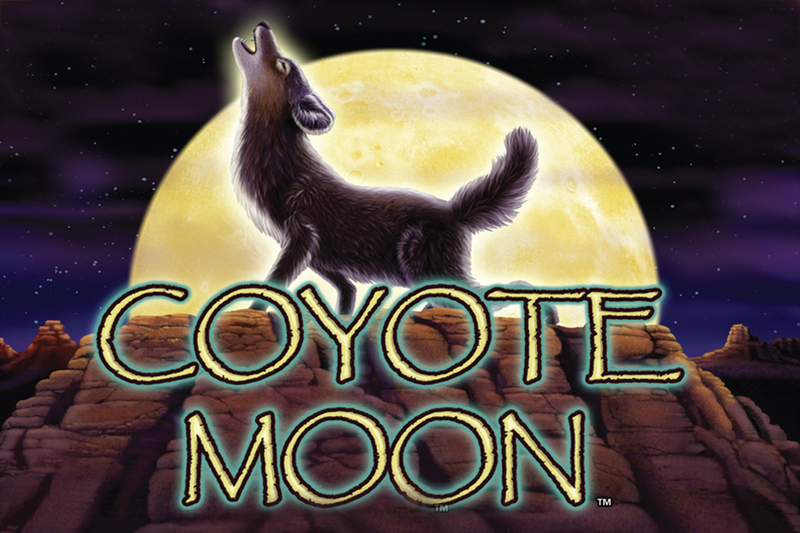 Look up at night and you may see the Coyote Moon too, but if you miss it fear not as you can grab it at the below casino sites instead. 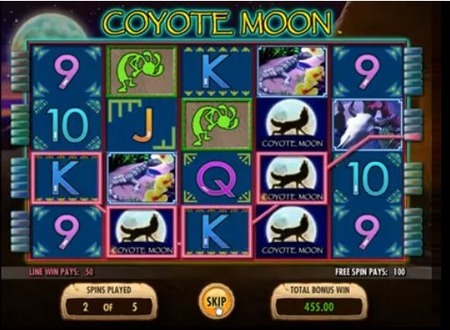 Coyote Moon is a 5-reel, 40 pay line game that offers a blood curdling 94.98% RTP. The game itself is set against a desert style background with coyote noises sounding away as the reels spin. Some symbols are represented by animals such as a lizard, a bird, a deer and a skull, these are your higher values. Your lower value symbols are depicted by the A, K, Q, J and 10, which almost look as if they have been handwoven onto fabric. Bet Amounts – Betting begins at £1 per pay line in play and can be increased up to £50 per pay line in play on Coyote Moon. This means spins can cost from £1 up to a maximum of £2,000. Obviously to get your desired stake you will need to amend the lines active and the amount per line before you hit spin. Wild Symbol – The Coyote Moon logo is your wild symbol and it will substitute for all others except the scatter. It is also your highest paying symbol, so landing 5 of these beauties on an active pay line will bag you a win of x1000 coins! Scatter Symbol – A red figure painted on cloth is your scatter symbol. Landing three or more of these will trigger the bonus feature. In order to trigger the feature you need to land the scatter anywhere on reels 2, 3 and 4. Stacked Wilds Feature – As the reels spin you will notice that the wild symbol appears stacked. This will come in handy as you need symbols to complete wins if they land in the right place. Stacked wilds appear more often within the Rising Moon Bonus game. Rising Moon Bonus Feature – Having landed 3 or more of the red figure scatter symbols, you will activate the bonus spins feature. An instant x2 multiplier will be awarded to the line win and you will be allocated 5 bonus spins. During the spins the red scatter will now turn green, land three of these on reels 2, 3 and 4 to retrigger the bonus again and again. With no limit on the amount of times it can be triggered this can be very rewarding. On the whole Coyote Moon is fun to play with some interesting features. With the theme of the game being what it was we did expect maybe a more relevant feature, but we weren’t overly disappointed by its absence. Wins came fairly regularly in the main game albeit usually on the smaller side. The bonus spins are amazing and can retrigger easily, so this is where the bigger money is to be made.